"You can think of a fuel cell as an inefficient battery"
So. Who cares about BEVs when FCVs are right around the corner? Well, besides vehicle price, fuel price, fuel availability, inefficiency, complexity, pollution and probability of production - and the fact that this technology is currently doing NOTHING to wean us off of oil right now, I can't think of any reasons not to love FCVs! The fact of the matter is - the promise of FCVs is making our air dirtier, and allowing us to remain addicted to fossil fuels that much longer. Why? Because with the promise of FCVs came the wholesale neglect for today's truly clean highway-capable personal transportation: Battery Electric Vehicles. The technical challenges are enormous. In September 2003, a U.S. Department of Energy panel on basic research needs for the hydrogen economy, chaired by MIT professor of physics and electrical engineering Mildred Dresselhaus, reported that transportation fuel cells are 100 times more expensive than internal combustion engines. The most mature hydrogen storage systems-using ultrahigh pressure-contain seven to 10 times less energy per unit volume than gasoline, and require a significant amount of compression energy. Just last month, a prestigious National Academy of Sciences panel concluded that such storage has "little promise of long-term practicality." And a report published this month by the American Physical Society concluded that "a new material must be discovered" to solve the storage problem. The Department of Energy panel noted that the cost of producing hydrogen would have to be reduced by a factor of four to make hydrogen economically competitive with today's fossil fuels. Major advances would also be required in hydrogen infrastructure and safety. The panel concluded that these gaps "cannot be bridged by incremental advances of the present state of the art," but instead require "revolutionary conceptual breakthroughs." Watch this NOVA show for some of the hurdles that Fuel Cell Vehicles face today. ° In 2008, a "green" hydrogen station opened in Sacramento. The station has extensive solar panels (80 KW), and uses the produced electricity to perform electrolysis, and compresses the hydrogen up to the 5000 psi needed by the hydrogen cars. It is energy neutral on the grid (net zero grid use). It powers hydrogen cars from sunlight, right? Sounds COOL! 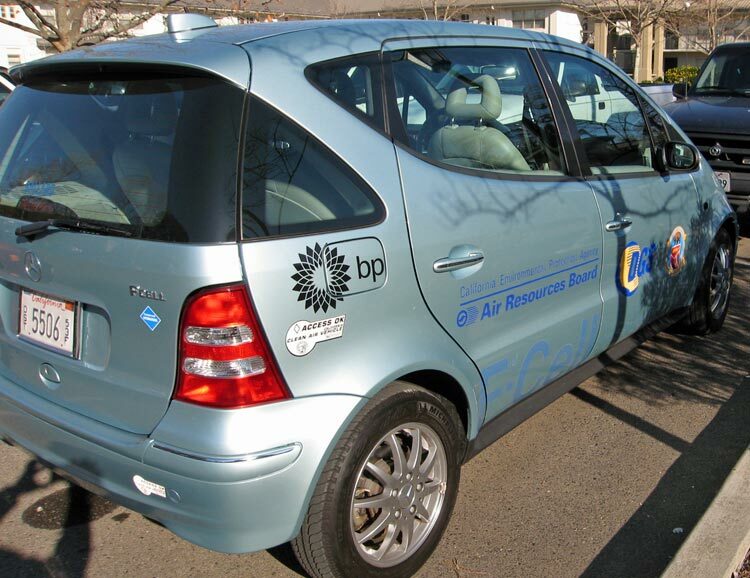 It's a joint venture between the City of Sacramento, BP, US Department of Energy, and Ford Motor Company. Now the details: The station cost $3.2 million, including the $1.7 million in solar panels. It produces 12kg of hydrogen per day (about the energy equivalent of 12 gallons of gasoline). It will be used by the city of Sacramento to power their 7 hydrogen cars each being driven 12,000 miles/year. If you figure the cost of the money at 5%, assume that the life of the facility is 20 years, and that there will be no maintenance or human involvement in 20 years (unlikely), the cost of each fill up (to go 230 miles) calculates to $879. Cost per mile: $3.82. A 20 mpg gas car costs about 20 cents per mile, and an efficient electric car costs 3 cents per mile. If the output of the solar array on this station was instead used to feed battery electric cars or plug-in hybrids, then the facility could support 54 electric cars, instead of 7 hydrogen cars, all being driven 230 miles per week. (The 80 KW solar array on the station will produce about 440 KWH per day, and a decent electric car or plug-in hybrid gets about 4 miles per KWH). Excerpt from Who Killed the Electric Car re. Fuel Cells. And here's Jack Nicholson in the 1978 talking about this wonderful, cheap fuel that is "non-polluting" and "limitless." Fuel-Cell Vehicles: Solution or Shell Game? One kilogram of H2 gas is equivalent to about one gallon of gasoline, or about 35 kWh electric power. Eight gallons of gas, enough for the average car to go 160 miles will fit in about one cubic foot. To get one kilogram of H2 into one cubic foot, the gas would need to be compressed to about 10,000 psi. At that pressure, the H2 gas is about one eighth the energy density of gasoline. 1 gge (gallon of gas equivalent) of H2 = 11,200 liters at STP. (One mole of any gas at STP occupies roughly 22.4 liters. H2 contains two protons and no neutrons, so a mole of H2 should weigh about two grams. Half of that, one gram, should occupy about 11.2 liters at STP). The energy needed to compress H2 for on-board storage is a large issue. Current PEM FC's are lasting between two and five thousand hours. On Earth Day, 2004, this speech was given in the Sacramento area. While quite long, this is a fantastic piece by Alec Brooks of AC Propulsion on the comparison of EVs and FCVs. In that paper, you will find this document that shows a Fuel Cell Vehicle to be FOUR times less energy efficient than a comparable BEV. "Wally Rippel, a research engineer at AeroVironment in Monrovia, CA, who helped to develop the General Motors EV-1 electric car and the NASA Helios Solar Electric airplane, offers another way to look at the situation. He calculates that in a car that employs an electric motor to turn the wheels, a kilowatt-hour used to recharge batteries will propel the auto three times as far as if that same kilowatt-hour were instead used to make hydrogen for a fuel cell." "According to Linde Gas (Hydrogen Suppliers in Europe, for the HydroGen3 drive across europe) it takes approximately 1,5 kWh per Liter to liquefy hydrogen"
"As far as I know, no one who is technically literate is an enthusiastic supporter of fuel-cell-powered vehicles" -- Donald R. Sadoway, professor of materials engineering and faculty fellow at the Massachusetts Institute of Technology, and a nationally recognized battery expert. 2003. "I said this years ago, and I see no reason to change my mind: The family-owned, garaged vehicle is the last vehicle that's going to get a fuel cell. . . I doubt that I will ever see a hydrogen car for personal consumption in a showroom." -- Geoffrey Ballard (Who's company, Ballard Power, built the first commercially available fuel cell). 2003. "The laws of physics can't be changed by research projects, votes of parliament, presidential initiatives, capital investments... The hydrogen economy has no past, present or future." - Dr. ULF BOSSEL, 2007, European Fuel Cell Forum. The Toyota RAV4 EV is 300 watt-hours per mile. The Honda FCX from electrolysis is 1200 watt-hours/mile. The EV1 and Tesla Roadster is about 170 watt-hours/mile. Cost of the fuel cell - A fuel cell stack capable of moving a passenger vehicle presently costs approximately one million dollars to build as a one-off due to the fabrication costs and raw materials such as the platinum catalyst that no one has yet found a way to eliminate. $7,000 per rated kilowatt is the expected price for mass-produced automotive fuel cells. A typical car will need a fuel cell capable of delivering 50-75kW to the wheels for decent "on-ramp" performance, never mind the 0-60 times that sell cars today. Even if you cheat and go with a big battery pack to buffer demand and use a 50kW stack, you're still looking at a fuel cell stack costing $350,000. I think that RAV4EV battery pack could be replaced for about 10% of that figure - and those batteries aren't being produced anymore, never mind mass-produced! Life span of the fuel cell - Fuel cell stacks have operating lives significantly shorter than the average engine, typically a few thousand hours ... under laboratory conditions. Reality cuts further into this number. Hydrogen storage - on vehicle - In order to store enough hydrogen to drive a vehicle a few hundred miles on a tank, you need to either compress it to >5000 PSI or store it as a liquid. One kilogram of hydrogen has about the same amount of energy as a gallon of gasoline and hydrogen fuel cells approach double the efficiency of the typical gasoline engine, so you'll need to store around 10kg of hydrogen. Liquid hydrogen must be refrigerated to about 20K in order to be maintained and will slowly boil off in any practical storage vessel (to the tune of a tank going from full to empty in about 2 weeks and constituting a safety hazard). Compressing hydrogen to 5000 PSI requires spherical or domed-cylinder steel tanks weighing a good 65 or so times their contents or lighter (and mind-numbingly more expensive) carbon-fiber tanks tipping the scales at around 10 times as much. Steel tanks are significantly more crash-worthy than carbon-fiber tanks, but nowhere near as safe as a gasoline tank storing a liquid. Even without an explosive gas within, I imagine that a tank that ruptures at 5000 PSI would completely destroy the vehicle and its contents. Hydrogen transportation - Given the mass of tank required to store a few kilograms of hydrogen for use in a passenger vehicle, transporting it by tanker is out of the question - a tanker the size/mass of a conventional gasoline tanker might be able to carry about 200kg of hydrogen. As I have mentioned previously, hydrogen pipelines aren't overly practical since hydrogen routinely escapes high-quality gas seals and even solid metal containers, embrittles steel, and is otherwise uneconomical to pipeline at low pressures. Hydrogen compression/liquefaction - Compressing hydrogen to 5000 PSI requires no small sum of energy. I think it takes about 20% of the net energy content of the hydrogen itself. Liquefaction takes double that. It is not clear whether a fuel cell vehicle can be designed to recover some of that energy loss by extracting energy from the fuel's expansion via a turbine or somesuch. Fuel station considerations - A hydrogen fueling station will be inherently more expensive than a gasoline/diesel station. Its power consumption will be massive if the hydrogen is made on-site via electrolysis. Trucking (or some improbable piping) the fuel in will alleviate the electrolysis load, but the station still needs to operate industrial-grade compressors to fill vehicles' tanks. Reforming methane onsite ups power consumption again and now you get a distributed source of CO2! The station will need to store some quantity of hydrogen onsite safely in underground tanks costing some ungodly sum due to the pressures involved and the relatively large quantities of hydrogen that must be kept onsite. Electrical consumption will also be staggering to the tune of about 900 watt-hours of energy per 20kg fillup assuming 5000PSI tank pressures and no on-site processing. 04.28.04 Eco party at Genentech Vacaville. I found myself parked next to one of the UC Davis FCVs for the event. The amount of energy that this FCV consumes at idle would power me down the road at about 25mph. And for accuracy, this is a FCHV, or Fuel Cell Hybrid Vehicle. Why hybrid? Because it has a bunch of battery capacity on board as well as the Fuel Cell stack. Toyota Rav4EV - meet the Toyota Highlander FCHV. The vehicle on the right cost about 150x as much money to make as the vehicle on the left, and requires 4x the energy to create the "fuel." That's the kind of math that I can do in my head. Mercedes' attempt at a FCV. You should hear how loud and wheezie this thing is!